Dominion: Native Village | Wake up, Meeples! Native Village is gradually becoming one of my favorite cards in Dominion, and that’s because I like doing “cool Native Village tricks”. One of the fundamental things about Dominion is that scoring points is supposed to make your deck worse, but Native Village can get around that in ways that make me happy. On the other hand, it’s not a very good card, so trying to pull this off can backfire if the situation isn’t just right for it. Native Village is a village, it does village things. This isn’t an article about villages, so I’m not going to go over all of the points that apply to all villages. 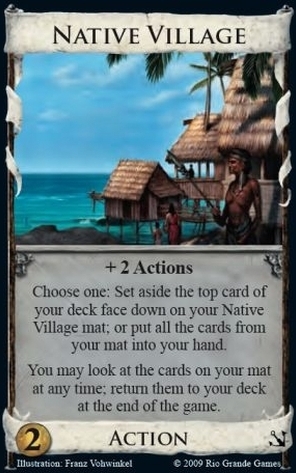 Native Village costs $2, and that’s because it’s not really a very strong card. The comparison to Village can be made where Village draws you one card every time you play it, while NV draws you N/(N+1) cards on average, where N is the number of times you set aside a card to your mat before picking up. Since this average draw is always going to be less than 1, it’s not a favorable comparison, but if you’re wanting to use NV for the same thing as Village, it can be instructive: you want to pick up cards from your NV mat as little as possible to maximize your draw from Native Village. This is typically done by having lots and lots of Native Villages and only picking cards up off the mat if there’s a significant, immediate benefit to doing so. But that’s really hard to actually do. You typically want to draw cards the most at the beginning of your turn and the best (only) way to do that is to leave them on the mat at the end of your previous turn. But that means you aren’t playing them! What cards are so important to you that you need them at the start of your turn, but you could get through your entire previous turn without playing them? If it’s payload, then you’re sacrificing your payload for reliability. That feels pretty bad. If it’s draw components, then usually you’ve severely overbuilt. These don’t do very well, so in this situation, it’s usually really difficult to maximize that N/(N+1) term. There’s the “classic” Native Village/Bridge combo deck, which involves setting cards on your mat the whole game and ending the game in a huge megaturn where you play a lot of Bridges. In some situations, a properly played NV/Bridge deck is the best thing you can do, but Native Village really isn’t all that great at enabling megaturns because most of the time you’re better off playing your payload cards every turn so you can build faster. Usually Bridge combos or similarly explosive payloads are the only things out there strong enough to justify building in this way, and if there’s any draw out there at all, you’re usually better off using that instead of playing for a Native Village megaturn. So the really cool thing to do with Native Village’s ability is to use it as pseudo-trashing by never picking cards up from the mat. Actually, not many cards out there will let you keep your Provinces around and not have them in your deck — there’s only Island to compete with but normally there aren’t enough Islands to go around to make this work, among other things. With the right support, one single Native Village can represent all of the green cards you hope to “have in your deck”. Yes, these decks can be quite satisfying to pull off, so let’s talk about when they’re good. The easiest example is the Apothecary/NV deck: with pretty much any +Buy at all, this is a lightning-fast, reliable Province-per-turn deck. Apothecary is great at getting you your NV in hand while putting a green card on top of your deck, and the big synergy is that most Apothecary decks tend to stall with any reasonable amount of green in them, so NV’s role is quite welcome there. Aside from Apothecary, though, relying on deck inspection to get your greens onto the mat just doesn’t cut it in practice. There are two main ways to get this to work for you, and they both involve drawing your deck as a prerequisite. You can either target-discard the card, then play your NV, or you can gain a Province mid-turn and then mat it. Keep in mind that this will almost always require another Village on the board besides NV, since the only thing out there that’s non-terminal AND capable of gaining Provinces mid-turn is Governor, and it’s really tough to use NV as a splitter this way because you have to draw your entire deck first without playing any villages, then play NV to put nothing onto the mat, then gain the Province, then play another NV to mat the Province. Rough. So we’ve talked about the mechanics of NV pseudo-trashing, but when are they actually good? Sure, thinning Provinces is nice, so if you’re looking at the opportunity, sure do it. I’m talking about when it’s best to roll in Native Village pseudo-trashing when building your deck. A little bit of math. You’re going to have one NV in your deck at the very least, and most of the time you’ll start your turn with a Province in your deck that you’ll have to draw in order to put it on your NV mat. You’ll want these two stop cards to be much less than what you’d otherwise have if you just left the green in your deck, and maybe take into account that you probably could have just bought another draw card instead of the NV. It also needs to happen before the game is over, since if the pseudo-trashing finally worth it and you never get to take a turn with those benefits, then it wasn’t helpful there either. What this points to is that these tricks are really only practical in decks that aim to buy just one Province or Colony per turn. Gaining and matting two cards per turn doubles the opportunity cost and ends the game twice as fast. So what you’re really looking for is a quick way to get up to Province-per-turn and then stay reliable. NV tricks can work well with Wall around, since they allows thin decks to stay viable without picking up too many components or overdraw. As discussed earlier, Apothecary is great for this. Governor, not as much, since the payload of most Governor decks is multi-Province turns. Other synergies here include attacks that you want to play every turn like Militia or Pillage, but be careful of stuff like Rabble or Ghost Ship, as Native Village can serve as a soft counter to those attacks. Junking attacks can work if it’s one of those games where you’ll want to go for them in the mid-game or late game. This entry was posted in Dominion, Tabletop Games on September 15, 2017 by Adam Horton.